Suppose that I have a loan value x and interest rate r. The simple interest is then x*(1+r). If I take out a loan compounded annually and paid monthly for 12 months the amount at the end of the year would be the same. Why is it then that loan calculators give a different value? For example, if I were to borrow 100 at 10% I would owe 110 in simple interest and so 110/12 each month, yet using an online calculator I get that I owe 5.48 in interest for a total of 105.48. Why the discrepancy? EDIT: Since it's due to differences in principal due, which one is actually the APR of the loan? 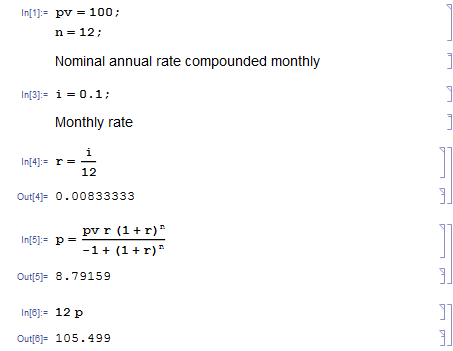 Most online calculators use monthly compounded interest rate (I created a few). What this means is that it assumes you pay each month (as with usual payments), this has the effect that the principal amount becomes less and less through the course of the year and the interest becomes less and less. This is not really what happens with yearly or simple interest, it's more like a "boom" 10% added each year! But this should give you a feeling of how it works. I hope this made sense. It should be noted that banks and lenders usually have there own set of formulas they use to calculate the interest rate (usually something close to compounding daily), thus you will not know what you will pay until they tell you. A mathematical expression for a loan can be made by setting the sum of the discounted future payments equal to the present value. The closed form can be found by induction from the exponential summation. 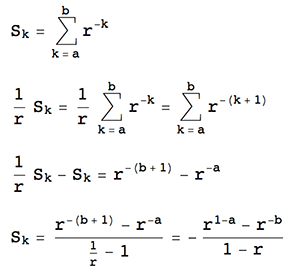 This formula can be used for your calculation. Not the answer you're looking for? Browse other questions tagged loans interest-rate or ask your own question. Why $537 a month for $100,000 loan, 5% interest, 30-yr term? Suppose earning an APR of 7% for 5 years, with interest compounded quarterly. What is the EAR? What is the Total Return? Why does my interest charged (on loan) fluctuate from my own calculations?